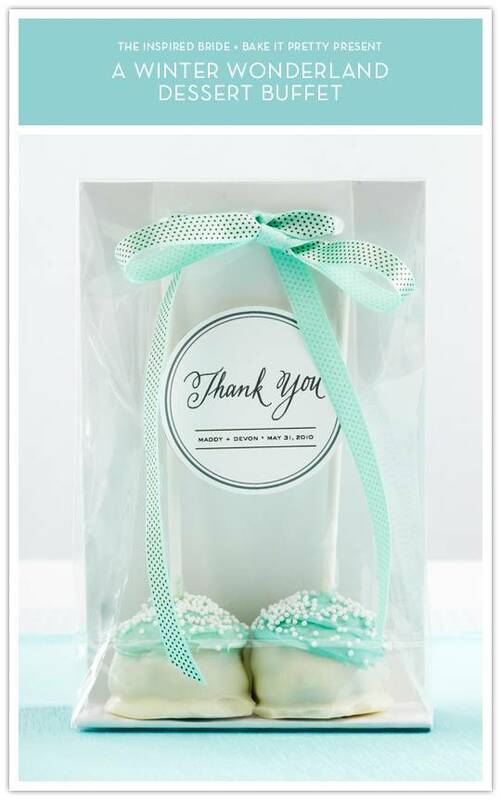 These treat bags are great for your guests to grab their treats with and go. They’re lined to give a little extra support to them since more fragile desserts are present as well as candy, and they’re perfectly sealed with a ribbon. Open up a treat bag and cut 1.5″ down the seam. Remove the two inches of bag on all sides except for the front wide panel so that the remaining side has a newly created flap. Fold the flap over to that the fold aligns with where the bag was cut, then crisp the fold with a bone folder. Flatten the bag and taken new measurements. Open the bag and measure the expanded width, and add this measurement onto the measurement of the height of the bag. With the adjusted measurements, cut a piece of Bristol board that matches them. From the bottom of the cut card, measure the height of the card up to the bag’s width measurement (for example, if the width was 2″ then measure that amount from the edge) and fold across the card at that point with the bone folder. This card is now set up to line your bag, and be compressed for storage. Insert it into the treat bag with the bottom lining facing towards the side of the bag with the flap. After customizing the label sheet with your names, event date, or both, print the sheet on cover weight paper and cut one out along the exterior dotted line. Using a glue stick, add adhesive to the back of the label and affix to the treat bag (on the side that has the flap) in your desired position. Using a handheld hole punch, punch two holes about 1.5″ from either side of the bag that go cleanly through the folded over flap, the card, and both sides of the bag. They should line up, so punch carefully! Cut a length of ribbon and feed it through the holes and tie in a bow – the length of the ribbon is up to you, so see what you think looks good on the size of the bag you’re working with. very cute! The PDF thank yous can be used for different things as well! Ohh, so cute! I loved the calligraphy! Thanks for this post. I was looking for some wedding favor ideas and these are just lovely. How do you print onto the template? Are you trying to add type to it? Like Jackie, I am curious–I don’t have a ton of experience with PDF files…how do you add type/customize your tags? You need to download a trial copy of Photoshop or Illustrator if you don’t already own it and open it up in either of those programs. It will allow you to add your own copy with your own fonts if you use the type tool. Where were these bags purchased? What are the dimensions? The flat bottom bags I’m finding from the wedding favor websites seem too small (only 3 inches wide). I believe they came from Nashville Wraps. Look for a bag with gussets.